I had never really thought about Texas as being one of my 'Bucket List' places before. Don't get me wrong it was on our US tour list and I have always admired the photos of others, but other places in the US, such as New York, Chicago and Florida, had been before it in the epic US trip list. All that changed recently, when Kyd came running down the stairs with his iPad brimming with excitement. The new BATMAN ROLLRCOASTER pre-view video from Six Flags Fiesta Texas in San Antonio, which in itself looks like an awesome place to visit. He was almost wetting himself with excitement. Two of his biggest loves put together into one big fat adventure. BATMAN™: The Ride is a world class 4D Free Fly Coaster that thrusts you into a totally immersive, high-speed Gotham City adventure. You’ll board Batman’s latest creation – a mind-warping thrill coaster loaded with special effects and cutting edge construction. The utterly innovative design of the ride delivers a brand new coastering experience that is the only one of its kind in the world. Magnetic fins cause you to flip as you fly over the top of a 12-story hill and two beyond vertical drops. BATMAN™: You'll take flight over a steel track which delivers six full inversions. You’ll descend down two beyond-90-degree raven drops, incorporating the stomach-shaking sensation of true freefall right in the middle of the ride! 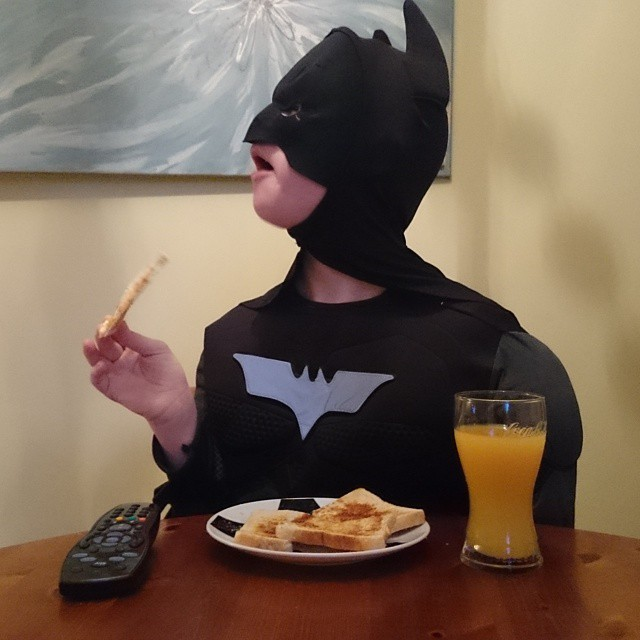 You won’t need a Batsuit to ride – just Batman-level bravery... which luckily Kyd has. Now we were in a conundrum, if we went to Texas in 2015 for the launch of these awesome DC Comic rides with our Batman loving kids... uhhh which would we go to? I did a bit of research and if we hire a car we can fly into Dallas, which is a 9hr 20min flight (good job we all love flying), do the Justice League ride and all the others, stay there for a few days and see the sights. THEN, drive the 4hr+ drive down to San Antonio, stopping at a few of the cool little places along the way and finish the holiday on the epic Batman 4D ride in Fiesta Texas.... OR depending on cash flow, we can always fly from Dallas to San Antonio, which only takes 55 minutes and would be much more fun, although misses out the cool places along the way. Either way it makes for an EPIC TEXAS ROLLERCOASTER ROAD/AIR TRIP don't you think? Think of the memories, the photos and the videos we could make along the way. I've always told Kyd he can do anything if he puts his mind to it, he's never had a problem showing us that this theory works in the past. This time last year he rode 110 rollercoasters in Orlando, Florida. He has just said to me 'I wonder if we can beat that in Texas?'... Jesus, Kyd are you trying to kill me?! The 110 was hard enough for us old folks... but we can give it a try! He has his heart set on it now and the excitement is still beaming every time he mentions it!. Now to work out how to fund this madness.... Get thinking Batman! Alton Towers - Scream if you're another year older!! We Braved Fright Night... ARRRGGGHHHHHH!!! Thorpe Park - Are you Ready to Have a Scream at Fright Night? PortAventura - We're coming for you!